This recipe is ready in 10 minutes! I can’t tell you how happy it makes me to make a recipe this quickly! I don’t know why I don’t make it often, but, I am about to change that. I am going to make this often because I will never be bored! I can ad a plethora of ingredients with the couscous, changing its flavor each time. 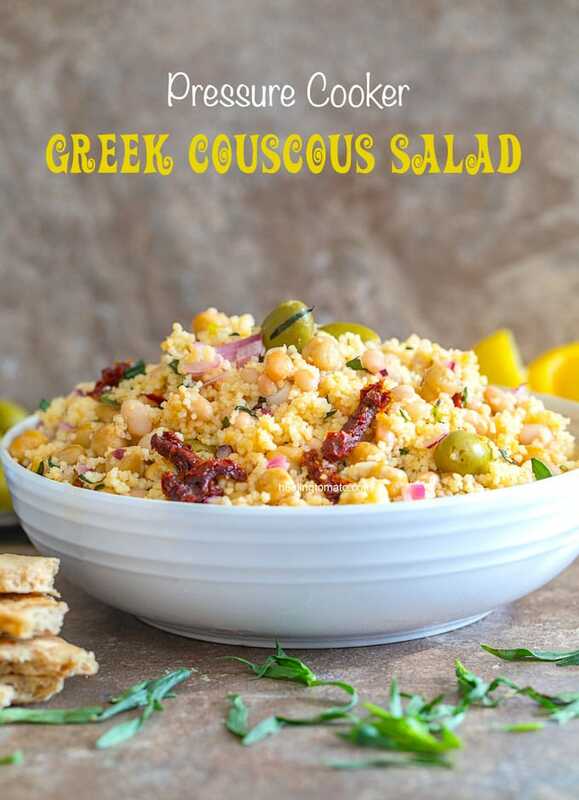 For this recipe, I made a Greek couscous salad which was perfect in every way! 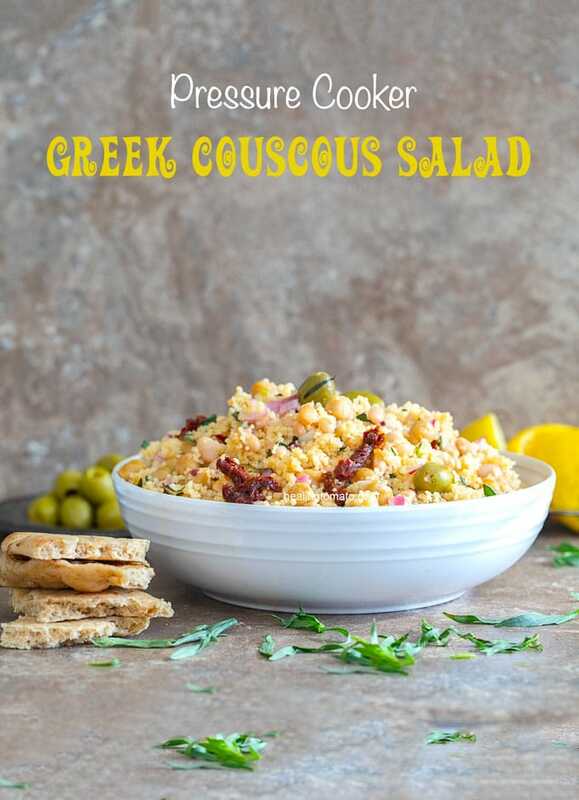 The Greek green olives added a delicious natural saltiness and tang to the recipe. I used plain olives, but, you can also use pimento stuffed olives. I used up all of my stuffed pimentos when I made my Ropa Vieja, but, I am sure they would be perfect with couscous too. This couscous salad has equal parts of chick peas and navy beans. It might be a little too much legumes in one recipe, but, that doesn’t bother me. I just loved how delicious they tasted in this recipe. Recently, chick peas made an appearance on my blog when I paired them with barley in this amazing pilaf recipe. Its been a while since I used navy beans on my blog. The first time I made them was in this navy beans salad recipe. I used them in my vegan dumpling soup too (white beans). Growing up, we used to eat them in toast and I was never a fan of them. Now, I have a new found appreciation for them. The star of this salad recipe is not the couscous though. Its the fresh tarragon because it adds so much aroma and flavor to this recipe. If you don’t have fresh tarragon, its ok to run to the store just to get some! Trust me, you won’t regret it. Fresh tarragon really makes this recipe and brings all the flavors together. For the dressing, I went with my all time favorite Lemon vinaigrette. Its quick and easy. Instead of making it before hand, I added all the ingredients of the dressing directly into the couscous. It saves time! How to cook couscous in the pressure cooker? Traditionally, you just need to add hot water to couscous and you are done! No hassle and no need to pull out your pressure cooker. However, I find it so much easier to cook it in a pressure cooker. First, I don’t have to wait for water to boil! Then, I have to wait for a few minute of soak time before I can use it in a recipe. For me, it seems more of a hassle to NOT cook it in a pressure cooker. You will see that cooking couscous in the pressure couldn’t be easier! It takes 2 ingredients and 5 minutes to make them. You can make a whole batch of it as part of your meal prep. Then, put it into different recipes to make your life easier. I added 1 cup of (affiliate link) Near East Couscous into the pressure cooker. To that, I added 2 cups + 2 Tbsp of water. In my Bestek pressure cooker, I choose the nutritional option button which cooks for about 5-6 minutes. If you are using a different pressure cooker or instant pot, you may have to experiment with the time and water amount. From what I hear, all the brands have a different way of cooking for 5 minutes. You can keep the water amount the same, but, increase the cook time. Couscous is one of those ingredients that can be frozen when cooked and uncooked. You don’t need to freeze an uncooked version. However, if you live in a hot climate, I would suggest you freeze them because they I have seen tiny bugs inside these couscous when left outside in the hot weather. When couscous is cooked, you should definitely refrigerate it. If you plan to eat them over the course of the month, freeze them in single portions so you can use only what you need. Is couscous a rice or pasta? Couscous is part of the pasta family. Its close to spaghetti than rice which means that you cook it in the same way. Couscous cooks much faster than pasta with very little effort. Just add hot water to it and you are good to go. What’s the difference between Israeli, Moroccan and Lebanese Couscous? Israeli couscous, also known as pearl couscous is slight bigger than than the Moroccan couscous. They look like tiny pearls which is why they have that name. They are often used in salad recipes and served as a side of many meat dishes. My favorite recipe using pearl couscous is my Mediterranean cous cous salad and my edamame cous cous salad. Lebanese couscous is slightly coarse in texture and the largest of the three types. It can almost be confused with the chick pea because they look similar. Lebanese couscous adds amazing texture to any recipe you add it into because they are very hearty and filling. What’s your favorite couscous variety and your favorite recipe? 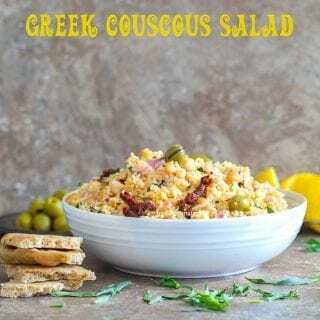 Simple Greek couscous salad made in the pressure cooker! – Navy beans are also known as white beans, so, pick either one. I used canned version of both the chickpeas and navy beans. Keep about 2 Tbsp of the aquafaba that comes with the navy beans to add to the couscous. 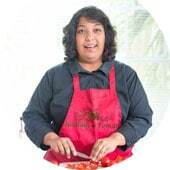 – Use an herb marinated sun-dried tomatoes for best taste results. You can add more than what the recipe calls for because they really taste delicious. – Nutritional information is approximate. I’ve never been happier to own a pressure cooker than right now. Thank you, Jenny. Pressure cooker is now my favorite gadget in the world. This couscous salad looks so amazing! All the ingredients go so well together. Definitely making this salad at home this week. Thank you, Kathy. Its my favorite way to make couscous now. Oh yay! Another Instant Pot recipe to try! Thanks so much for sharing the different types couscous. Sure helps when I’m roaming around the grocery store deciding which to get! This salad is a great side to any main dish! 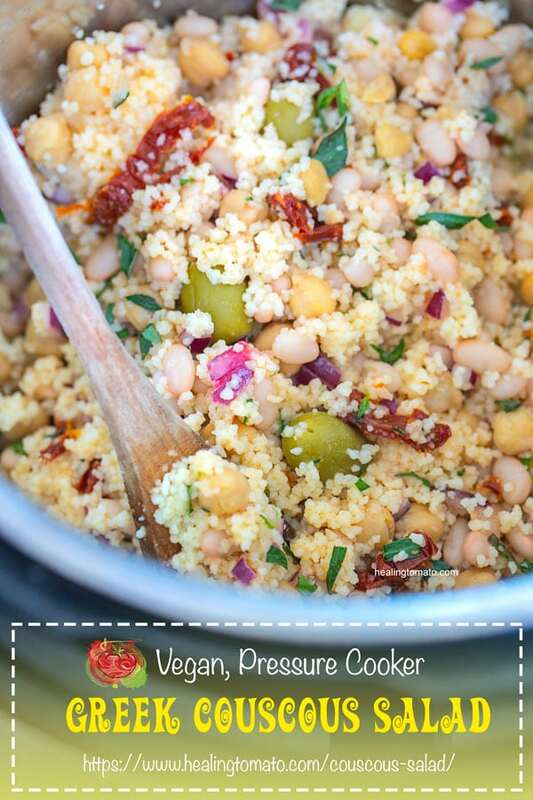 I’m in love with this recipe for couscous! So fast, simple and delicious; what’s not to love?! I am in love with this salad!!! It looks amazing and the flavors, WOW! Thank you so much, Deanna. Its one of my all time favorite salad recipes. This salad looks so good and the pressure cooker makes it so easy! I can’t wait to give it a try! 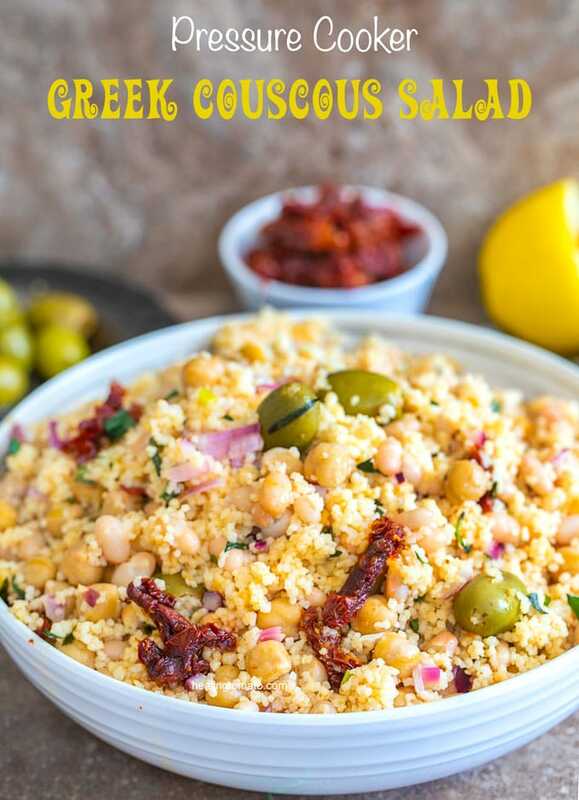 This was a HUGE hit with my family, they loved the olives and the sun-dried tomatoes so much… and the agave added just the right balance of sweetness! Definitely making this again! This couscous salad looks great. It’s perfect for these hot days where I don’t really want to cook anything. This has it all nice and neat in one dish! Oh wow!! I want to buy a pressure cooker just to make this dish! The flavor and colors are incredible! I’ve definitely never had couscous like this! I love couscous! Can you believeI have never put it in a salad though?? 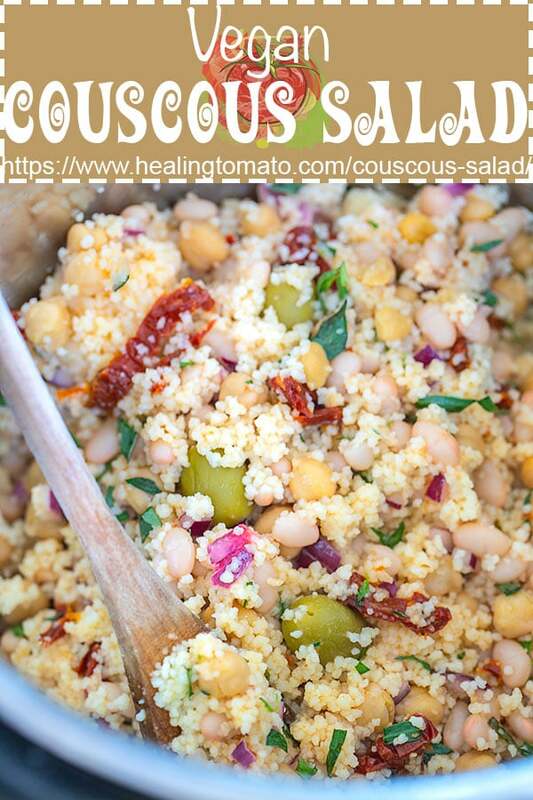 You can bet that is changing after seeing this amazing couscous salad recipe!! Thanks for sharing with me! This looks delicious! I love Greek food and all of the flavors in this. So glad to hear that, Rachel. 🙂 Thank you.